In today’s part of my series on Anne Boleyn’s life, I’m going to examine the negotiations which aimed to marry Anne Boleyn off to James Butler, son of Sir Piers Butler, and to settle the dispute over the title of Earl of Ormond. This article is based on a chapter of my book The Anne Boleyn Collection II, although that goes into much more detail. Before we look at the negotiations, we need to consider who the Butlers actually were, how they linked with the Boleyn family and why the Ormond title was under dispute. 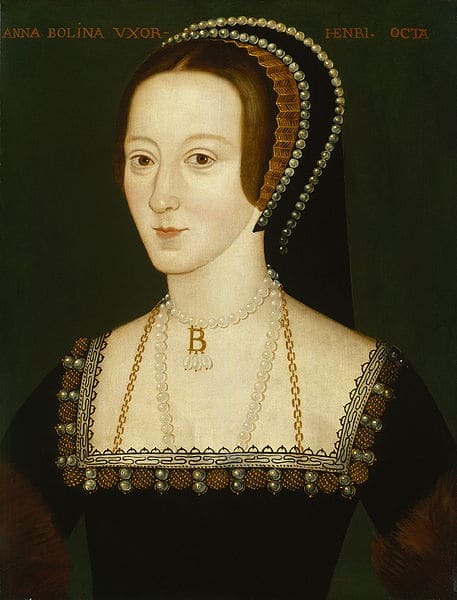 The Butler link came from Anne Boleyn’s paternal grandmother, Lady Margaret Butler, who married Sir William Boleyn, son of the wealthy mercer (and Lord Mayor of London), Geoffrey Boleyn from Blickling, Norfolk, and his wife Anne Hoo. Margaret was born at Kilkenny Castle in Ireland, somewhere between 1454 and 1465. She was the daughter of Thomas Butler, 7th Earl of Ormond, (known as “The Wool Earl”) and his first wife, Anne Hankford. Thomas Butler served on Henry VII’s privy council and was Catherine of Aragon’s first Lord Chamberlain, serving her from 1509-1512.1 Her paternal grandparents were James Butler, 4th Earl of Ormond, and Joan Beauchamp. James Butler was known as “The White Earl” and was the patron of “The Book of the White Earl”, an Irish religious and literary miscellany. 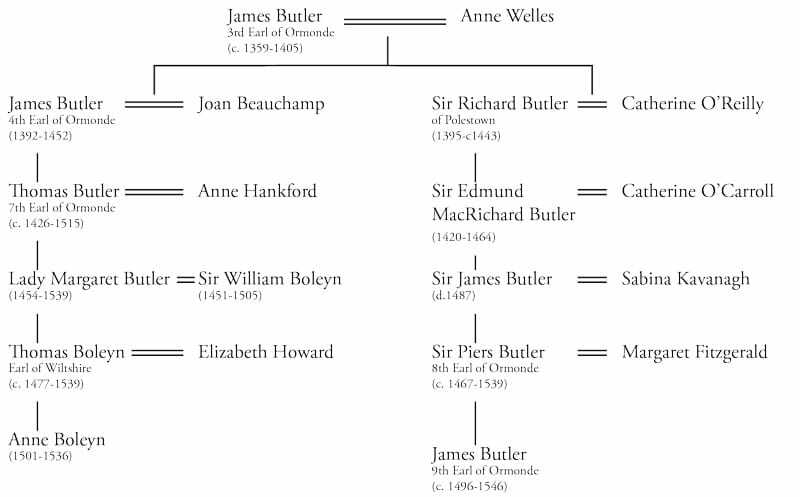 This simplified family tree shows how Anne Boleyn and James Butler were related, both being descended from James Butler, 3rd Earl of Ormond. You can click on it to see a larger version. The Butler family were descended from Theobald Walter, 1st Baron Butler (d. 1205), who was of Norman origin. 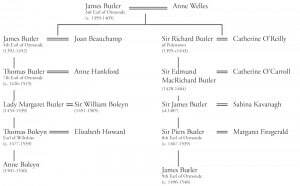 The family surname changed from Walter to Butler during the reign of Henry II. The name came from the fact that Theobald Walter was made the first Chief Butler of Ireland in 1177. This meant that he was the ceremonial cup-bearer (or the boteillier (Norman French) or “butler”) to Prince John. He became known as Theobald Walter le Boteler ( le Botiller) or Theobald Butler, after his title and the Butler family were “born”. As Butler of Ireland, he and his successors “were to attend the kings of England at their coronation, and that day present them with the first cup of wine, for which they were to have certain pieces of the king’s plate”.2 The title of Ormond also traces back to Theobald who was granted Irish lands (including East Munster or Ormond) by Prince John. On 3rd August 1515, Thomas Butler, 7th Earl of Ormond and maternal grandfather of Thomas Boleyn, died in his late eighties. He was one of the wealthiest noblemen in England and, according to Thomas Carte,3 he inherited more than £40,000 sterling plus plate. He also held two peerages – Earl of Ormond and Baron of Ormond, Irish and English peerages. Had no direct male heirs but he left two daughters: Anne (married to Sir James St.Leger) and Margaret (wife of Sir William Boleyn), Thomas Boleyn’s mother. Both Thomas Butler and his brother, Sir John Butler, 6th Earl of Ormond, before him, had been absent from their Irish estates for a long period due to the Wars of the Roses. Their Ormond estates were managed by their cousin, Sir James Butler (d. 1487), a member of the Polestown branch of the Butler family, who came to regard the estates as his own. When Thomas Butler died in 1515, therefore, James’s son, Sir Piers, considered himself to be the rightful heir because Thomas Butler only had daughters. However, the Ormond title was entailed to heirs general, not just male heirs, so Thomas Butler’s daughters, Anne St. Leger and Margaret Boleyn, were the rightful heirs. Margaret’s son, Thomas Boleyn, father of Anne Boleyn, put forward his claim to the Earldom with the support of his King, Henry VIII. Regardless of the fact that the Boleyns and St. Legers were the rightful heirs to the title and lands, Sir Piers Butler, who was on the ground in Ireland, seized the estates and started styling himself Earl. He had the backing of the Irish Lords and people, but Thomas Boleyn had the backing of Henry VIII. It was a problem. A solution needed to be found to keep the Boleyns and St. Legers happy but also to keep the peace in Ireland, and Piers could help the English government control the troublesome Irish factions. The ladies’ evidence was impressive. On 12th December 1515, William Rokeby, Archbishop of Dublin and Lord Chancellor of Ireland, wrote to Thomas Wolsey to inform him that he had “been much occupied with the Lord Deputy in Sir Thos. Bullene’s cause.”10 He went on to say that Piers wanted the case to be tried under common law but that this would not suit Thomas Boleyn. It was a delicate situation. Rokeby explained that “The Deputy would have ordered him to appear before the King in England on a certain day, on pain of allegiance, but was dissuaded by the Abp. and others, who urged the danger of rebellion, for he has now made peace and confederation with Desmond and the three greatest Irish Lords of his party. Moreover, as he calls himself an Earl, he would be loth to lose the name” and then asked for Wolsey instructions on how to proceed. 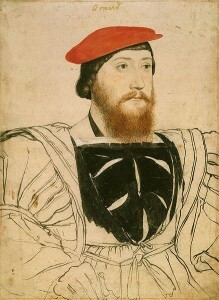 No settlement was reached and the earldom was still under dispute in spring 1520 when Thomas Howard, Earl of Surrey and Thomas Boleyn’s brother-in-law, was sent to Ireland as Lord Lieutenant. He quickly became on good terms with Sir Piers and this relationship, combined with his desire to get home to England as quickly as possible, caused him to try and come up with a solution that would solve the dispute and keep everyone happy. It is not clear how the idea came about, but in September 1520 Henry VIII wrote to Surrey thanking him for his reports and letters from August and September, and instructing Surrey that “He is to ascertain whether the earl of Ormond is minded to marry his son to the daughter of Sir Thomas Boleyn. The King will advance the matter with Sir Thomas.”11 Surrey and the Council of Ireland wrote to Wolsey on 6th October 1520, saying that they thought “it would be advantageous if a marriage were solemnised between the earl of Ormond’s son, now in England, and Sir Thomas Boleyn’s daughter.”12 The daughter in question was obviously Anne Boleyn, because Mary Boleyn was already married, and the son in question was James Butler who had been born around 1496 and so was about twenty-four at this time. He’d spent his early life on the Ormond estates (in the counties of Kilkenny and Tipperary) and had made his debut at the English court in 1513 when he joined Henry VIII’s forces for the invasion of France. He took part in the siege of Thérouanne in August 1513 but suffered a serious leg injury which meant that he limped for the rest of his life and became known as “Bocach” or “Bacach” (“the lame”). A marriage match between Anne and James would mean that the earldom of Ormond would pass to James and Anne on Piers’ death and therefore be in the Boleyn and Butler family. However, this would mean that Thomas Boleyn would not inherit the title, and although his feelings are unrecorded I cannot imagine him being best pleased with this compromise. This is the last record we have of the marriage negotiations. We don’t know exactly when the negotiations fizzled out, or why, but it seems likely that Thomas Boleyn was not happy with the plan. Anne’s feelings are unknown, but I suspect she would have had little choice in the matter anyway. We do know that James Butler was still in England in October 1522 when he was recruited into the King’s household, becoming an esquire-at-arms, and that he served the King for six years, returning to Ireland in 1528. Henry VIII obviously liked the man because he referred to him as “our faithful servant, James le Butler”17 and granted him land in Meath. Piers became 1st Earl of Ossory on 22nd February 152822,23 and Thomas Boleyn became the 9th Earl of Ormond (as well as Wiltshire) on 8th December 1529.24 Both men were finally happy. James Butler returned to Ireland in 1528 and in 1530 he married Joan Fitzgerald, daughter and heir of James Fiztgerald, late Earl of Desmond, and then set about being a ‘warlord’. After the fall of the Boleyns in 1536, Acts of Parliament were passed to cancel the agreement made between Piers, the Boleyns and St Legers and to allow Piers to benefit from the Ormond inheritance.25 In October 1537, Piers pleaded his case for the title of Earl of Ormond, giving proof that the earldom was “tailed to heirs male”26 and following that it was recorded that “The earl of Wiltshire is content that he [Butler] should be called earl of Ormond in Ireland, like as the two lord Dacres are called, one of the North, the other of the South”27 so Butler began styling himself Earl of Ormond again, as well as Earl of Ossory. When Piers died in August 1539 James inherited the Ormond title and held it until his death in October 1546. James died after being poisoned at a banquet at Limehouse in London and his body was buried at the Church of St Thomas d’Acres in Cheapside, London. His heart was interred at St Canice’s in Kilkenny, according to his instructions. He left his wife and seven sons. His widow, Joan, went on to marry courtier Sir Francis Bryan and then, after his death, her cousin, Gerald Fitzgerald, 15th Earl of Desmond. Joan was known as a peacemaker in Ireland and Elizabeth I relied on her to keep the peace between the warring Butlers and Fitzgeralds. Joan died on 2nd January 1565 and with the peacemaker gone, war broke out and there was the Battle of Affane between the two families, with Joan’s son, Thomas, as the victor. The Peerage of the United Kingdom of Great Britain and Ireland, II Scotland and Ireland:871. Carte, Thomas (1736) The Life of James, Duke of Ormond, Introduction, lxxxiii. Dean, William H. (1987) “Sir Thomas Boleyn: The Courtier Diplomat (1477-1539),” 54. Carte, Thomas (1851) An History of the Life of James Duke of Ormonde, 1:xliii – xliv. Archaeologia: Or Miscellaneous Tracts Relating to Antiquity, III:20–21. “Calendar of State Papers, Spain: Further Supplement to Volumes 1 and 2,” 30. Ives, Eric (2004) The Life and Death of Anne Boleyn, 372, note 71. “Oxford Dictionary of National Biography,” chap. James Butler, 9th Earl of Ormond and 2nd Earl of Ossory (b. in or after 1496, d. 1546), David Edwards. Dean, “Sir Thomas Boleyn: The Courtier Diplomat (1477-1539),” 95. “Calendar of Carew Manuscripts, 1515-1574,” 37–39. Is James St Lever the younger brother of Thomas St Leger who married Anne of York, sister to Richard lll? So that would make the Anne St Leger niece to both York Kings? Does that make the Boleyn family also cousins to the York Kings?